At Marquis Precision Engineering we are proud to be at the cutting edge of technology with the recent £1 million investment in our three Erowa Automation robots. Currently there are not many of these machines in the UK. Our Automation service, as the name suggests, allows us to programme into the system various jobs and the machine will run them automatically. At any one time, we can programme in a number of different components or just one type. This is good for customers looking to create prototypes or kits of parts, as Automation can make a complete kit in one go. The set-up options are incredibly flexible and all the machines are self-checking. We also have the ability to create incredibly fine details on components with our Micro Machining tools. These create details down to a few microns. These can only be inspected using our non-contact metrology machines due to the intricate nature of the components. At Marquis Precision Engineering we offer a variety of Conventional and High Speed Milling options, including 3, 4 and 5 Axis Milling. 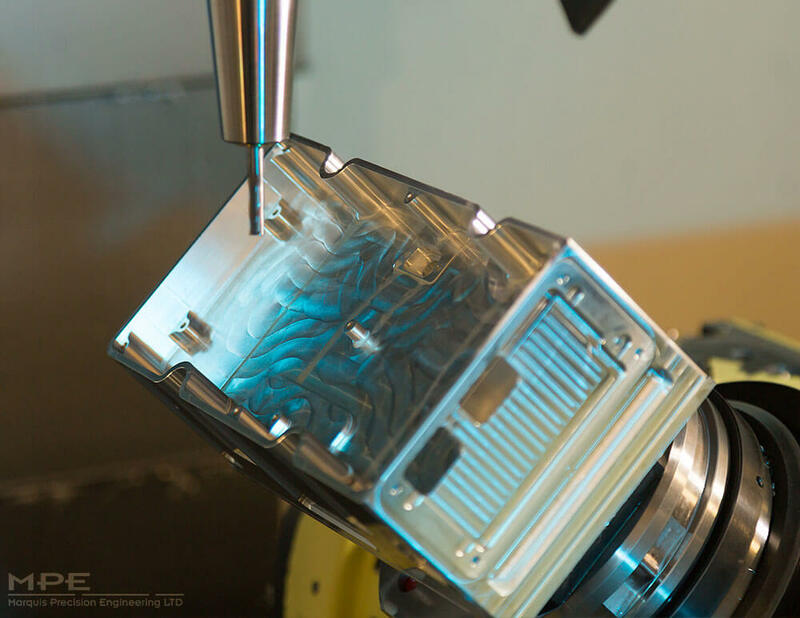 Conventional, or 3 Axis Milling, is used for larger, less demanding components, while High-Speed, or 5 Axis Milling, reduces the need for several configurations during the Milling process. It is a very versatile setup. We have six of the 3 Axis machines and six of the 5 Axis machines. However, these 5 Axis machines are very flexible, as they are actually 3 Axis machines with 5 Axis add-ons. This gives us greater resilience, reliability and flexibility in our workflows. 3 Axis machines, as the name suggests, mill components in 3 axis fields – the X, Y and Z Axis. 4th Axis Milling does all of the above, but adds in 360-degree rotation. Up until a few years ago 5 Axis Milling was the cutting edge of production, until Automation arrived. In 5 Axis Milling the component is milled in the same way as 4th Axis milling, but in addition the component is also flipped over. The materials we mill include: plastics, brasses, ferrous and non-ferrous metals like Kovar, stainless steel and aluminium alloys.